Following careful assessment of the condition of a masonry structure, coatings and sealants can be used for waterproofing, weather resistance or even a glazed, anti-graffiti surface. There is lots of talk about moisture management. Techniques vary between traditional stone masonry and that of modern construction, which uses various methods and materials to prevent moisture from migrating across the building envelope. But moisture management is only one piece of the puzzle in preserving masonry structures. Coatings and sealants are utilized on brick and natural stone in order to protect them from the elements or even graffiti artists. After careful assessment of the condition of the structure, coatings and sealants can be used for waterproofing, weather resistance or a glazed surface. The next few short articles provide a glimpse into some products and techniques now available in this area. Top image: STONE+ on clay brick. 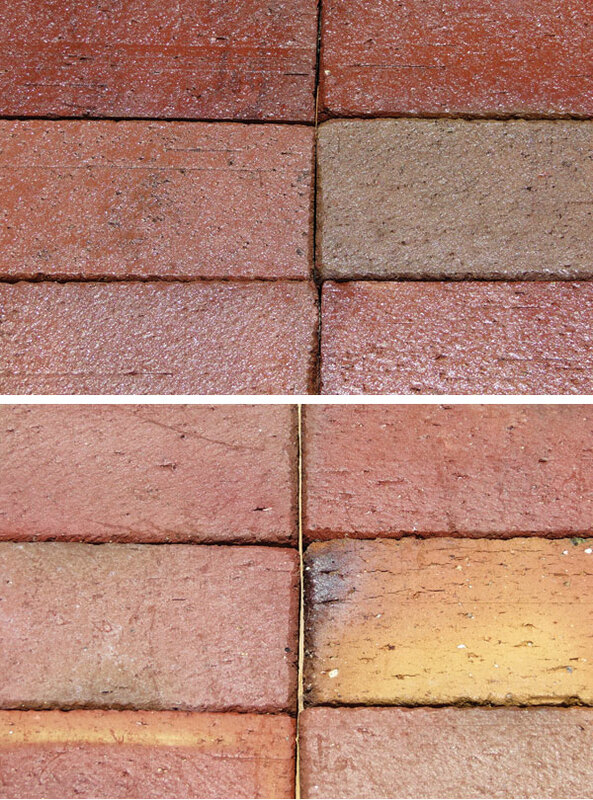 Bottom image: AQUA-X 33 on clay brick. Anyone who has sealed concrete pavers knows the challenges that are often presented: from the vast differences in porosity to trying to decide which sealer to choose. Clay masonry pavers offer the same challenges as their concrete brick counterparts in trying to decipher the best product to use to achieve the practical and aesthetic goals for the project. Two basic types of sealers are recommended for use on clay pavers. The first is a penetrating sealer. This type of sealer usually leaves the surface looking natural and is applied to help combat the intrusion of moisture, which can accelerate the growth of mold and mildew. A great penetrating sealer choice is Black Diamond Coatings’ AQUA-X™ 33. This sealer is a one-coat application for a natural appearance with excellent moisture repellency. The second type of recommended sealer is a film-forming sealer. This type of sealer, while also aiding in the exclusion of moisture, adds an aesthetic aspect to the surface. Film-forming sealers often enhance to color of the paver, as well as offer different levels of sheen, depending on the type of sealer chosen for the project. We recommend using Black Diamond Coatings’ STONE+™ for a color-enhancing, satin finish to your clay pavers. This product is also a one-coat application. The key is to use products that are manufactured to work with clay, while also following any application instructions that may differ for masonry. Concrete paver sealers generally are not recommended for clay masonry. The products we produce and recommend are commercial grade and will keep your pavers looking great for years to come. David Warren is president of Black Diamond Coatings, Inc., a national producer of bio-based, environmentally friendly, low-VOC sealers for concrete, pavers, stone and wood. For more information, visit www.BlackDiamondCoatings.com or call (800) 270-4050. A recent upgrade of Chifley Sports Reserve, one of the largest sports complexes in Randwick, New South Wales, Australia, included constructing two amenities buildings complete with kiosks, storage, meeting rooms, toilets and change facilities. Situated between the reserve’s two main sports ovals, along an east-west pedestrian pathway, the buildings create a central focus for the reserve. A series of concrete blades, situated at the ends of the buildings, are shaped to capture a long, flat roofline and to enable transparency and access between the northern and southern sports fields. The buildings’ striking façades were created by Simply Precast using Robertson Façade Systems’ proven brick inlay system. 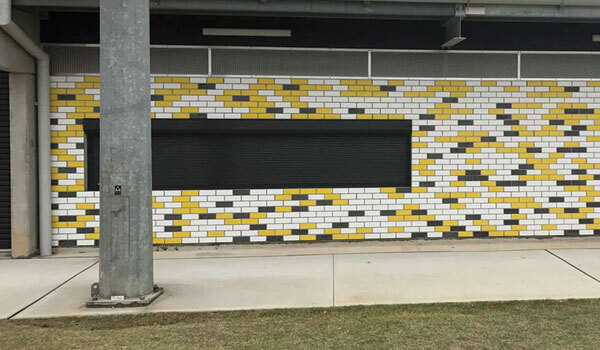 Using this system, Simply Precast placed glazed thin brick tiles, in black, white and yellow, supplied by Robertson’s Building Products, into concrete on the external panels in the precast factory. The panels were then delivered to site, and quickly and easily installed. Completed in 2016, the choice of glazed brick facing tiles for the buildings’ façade was a clever one, for both practical and aesthetic reasons. The glazed brick tiles are not only durable and create a strong profile in the center of the reserve, but they also easily meet a challenge common to many community facilities — graffiti removal. Glazed brick tiles are incredibly easy to clean. They make the process of removing graffiti much simpler compared to traditional porous masonry surfaces, using environmentally friendly methods. Not only is this in line with Randwick City Council’s graffiti management policy, but it’s also sure to put a sigh of relief on the faces of the personnel who are charged with the task of removing graffiti. 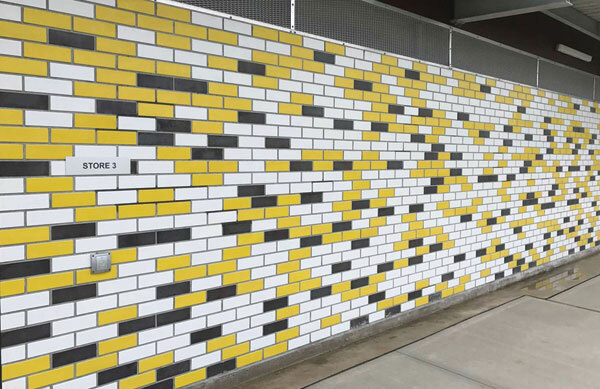 For more information on this project, Robertson Façade Systems’ brick inlay system or glazed brick tiles, visit www.robertsonfacades.com.au. 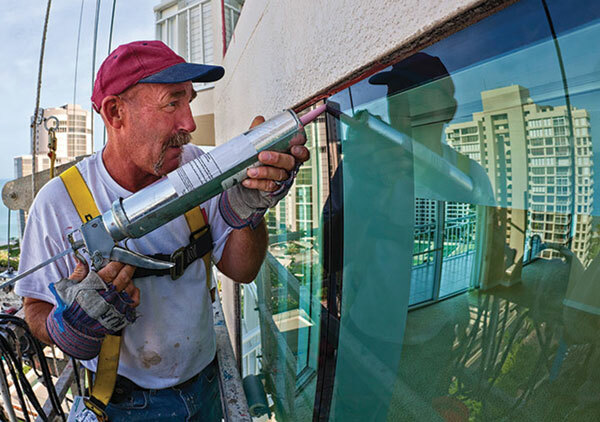 A new guide aims to help predict how building sealant systems will perform over time using accelerated testing methods. The new standard (to be published as C1850, Guide for Improved Laboratory Accelerated Tests to Predict the Weathering and for Developing Methods to Predict the Design Life of Building Sealant Systems) was developed by ASTM International’s committee on building seals and sealants (C24). The guide outlines a systematic way to develop realistic tests that show the long-term impact of weathering and other factors. 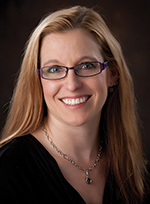 White says that the proposed standard could be useful for anyone in charge of choosing or buying sealants. He says the new standard could potentially serve as a model for the development of accelerated testing standards for other materials. One look at the MARTa Herford Museum in Herford, Germany and it’s obvious whose hand was holding the pen, drawing the first conceptual designs for this playful structure. Frank Gehry began putting his distinctive touch on the brick and stainless steel structure in 1998.